This entry was posted by Doug D on December 26, 2010 at 1:19 am, and is filled under Bike Polo, Media/Press, Products. Follow any responses to this post through RSS 2.0. You can leave a response or trackback from your own site. That’s T-Penny from Pittsburgh, AKA Devin. a VP rep gave me a pair of those pedals. i was reluctant to put them on my bike from fear of shin bashing and cutting into the pavement. I wear hockey shin guards and rarely strike the pavement on tight turns. Plus I’m not an aggressive player getting into crazy crashes, so threat against other players is minor. 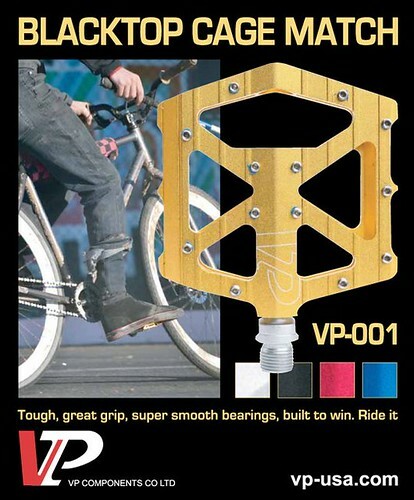 I used to use the plastic VP pedals, and I agree, the wide flat platform is a must have, and now with the sure grip pegs, there is no way you are falling off of these things. I was gonna guess Devin. Yeah, I would steer clear of pedals like that for polo. My left shin is pretty painted up from multible crashes on pedals like that almost 20 years ago. Metal pedals can cut to the bone and scar ya up real good.